A Collection of Fly Fishing Recipes, from Exmoor. Top-flight chefs, including Bruce Poole, of Chez Bruce fame, Jamie Raftery at The Castle in Taunton, Andrew Dixon at Andrews on the Weir, Tom Aikens and Leiths, along with Exmoor locals, have donated recipes to an attractive and lavishly illustrated new cookbook in aid of South West Fishing For Life, the charity that help people recuperate after breast cancer treatment with the gentle but relevant exercise to be found in fly-fishing. Jack Sleight and Raymond Hull. Paperback. 160 Pages. 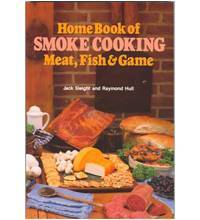 The book for every home smoker from beginners through to the more experienced. Including techniques for creating a home-made smoke oven, this book shows how to create superbly flavoured foods with a full range of recipes for meat, fish, poultry, game and miscellaneous delicacies.